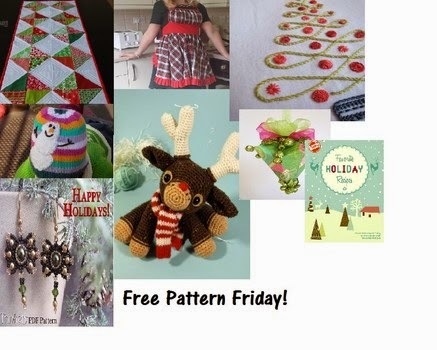 Free pattern Friday this week is a selection of free patterns includes 8 Christmas Patterns and Projects. All of the patterns can be downloaded in PDF format anytime to create them anytime of the year! Since the holidays are such a busy and stressful time of the year, It is a great time to start making your Christmas decorations and gifts. Celebrate your Christmas with all of these free patterns to make. Quilt a Free Classic Diamond Table Runner – Try this one in holiday colors or change the fabrics and make one for different seasons of the year. Get the Free Christmas Diamond Quilt pattern here. Sew a Free Traditional Christmas Apron Pattern – A vintage styled sewing pattern that features details like a gathered skirt, ruffled edges, and adjustable ties. Frosty Days Free Hat Knitting Pattern – A colorful knit hat featuring a snowman and vivid colors toknit up for kids and adults to wear. Crochet Free Murray the Reindeer Amigurumi Pattern- An adorable toy reindeer to crochet that will be the envy of any one who receives this little creature ! Makes a great addition to any Christmasand holiday décor! Christmas Bow Earrings Pattern – Make these beaded crystal earrings for the holiday celebrations. They make a great gift or accessory to wear for a holiday party. Embroidered Christmas tree pattern – This free embroidery pattern is for a decorated Christmas tree with all of the trimmings. It is a hand embroidery pattern that can easily be stitched up for a picture frame or on any item you want. German Bell Christmas Ornament – This paper craft puts a twist on an old-fashioned German Christmas ornament. Mix and match colors to make this ornament a unique and modern decoration for any Christmas tree. Free Holiday Baking eGuide – While you can’t bake your cookies ahead of time this eGuide can help you plan out your recipes for the holidays. There are tasty cookies and other delicious holiday recipes to make in this free guide. All of these free projects and patterns can be downloaded in PDF format by following this link and selecting the pattern you wish to download and create.